I'm rather excited to say that Shepherd Press has offered to give away FOUR copies of this title to four readers here at Reading to Know. I truly did find The Home Team to be a great encouragement and I think it is a very worthy read. If you are building family (or in need of repairing it) I highly recommend this read and am so glad for the opportunity to pass out four copies! Would you like to win a copy? Simply leave a comment below. This contest is open to U.S. Residents only and will be open through Friday, October 3rd. Please remember to leave a valid e-mail address in your comment entry so that I can contact you if your name is selected. I cannot tell you how many times I've had to choose a different winner because someone failed to leave an e-mail address and I had no idea how to contact them! Thank you, Shepherd Press, for this amazingly generous offer! I would LOVE to read it! Thanks for the giveaway!! I will like to read it. Looks very interesting. Thaks for this opportunity. I would love to win a copy! Enjoyed your first book, The Preacher's Payday.Miss those SCV days with you, Kim and the rest of the crew! 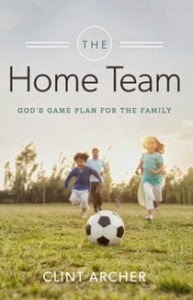 I would love to use this book as a date-night discussion book for Hubby and I. I think he will be able to identify with the "sports team" idea has he's played hockey and soccer. It might help us speak the same language! I would enjoy reading this book, and would love a copy. Thanks for having the giveaway. I love to read anything from Shepherding Press! I've heard such great things about Shepherd Press, but I don't think I've read any of their books yet(that I recall). I'd love to give this one a try! I am very curious about this book. I would like to read it.